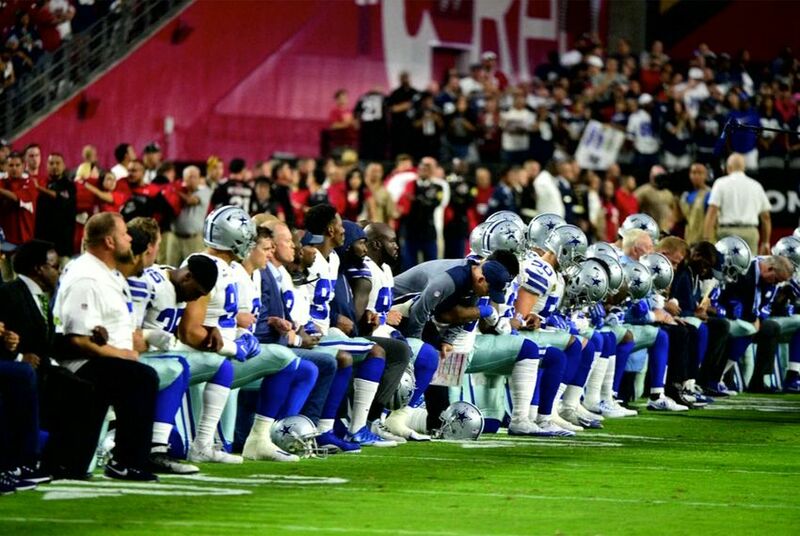 College protests against controversial speakers and the uproar about professional athletes protesting racial injustice have this in common: The protests themselves overshadow the ideas and practices being protested. The public square is starting to look like a daycare center before nap time. Everybody’s trigger is set to sensitive. We are locked and loaded, ready and eager to take offense. It has derailed our ability to argue. We don’t want to hear from people we don’t agree with, or let anyone else hear those people, either — whether that’s in a lecture hall on a college campus or at a professional football game. Protesters have decided, with a fair amount of complicity from invertebrates in charge of many American universities, that college shouldn’t be a full marketplace of ideas, unpopular speakers should be silenced by any means necessary and the very idea that someone on the other side could be heard is somehow offensive in and of itself. And we have, this week, the president of the United States telling the owners of sports teams that they should fire players who take a knee during the national anthem to protest persistent unjust treatment of minorities. Political correctness turns out to be common on both sides of the political fence. Chill out. Toughen up. Stop taking instructions from the tribal leaders whose power comes from the public’s anger and pain. Listen to the other side. If you don’t want to listen to something, don’t. If you don’t want to build someone up, ignore them. Free speech lets you take part in the argument without getting tangled up over whether others ought to have a say. They have a say. You have a say. Instead of focusing on how we debate, focus on what we debate. Professional athletes can do whatever they want when it comes to speaking out. There’s a notion out there that people who are making millions should sit down and shut up. Here’s a newsflash: People with millions of dollars don’t have to shut up — they have millions of dollars. Celebrities — sports figures among them — have big stages from which to speak. Maybe you think it’s more acceptable to make everyone stand and cross their hearts during the Star-Spangled Banner, but getting your attention is the goal of a protest. Lots of us are riled about what other folks are saying. It’s become the national sport — taking offense at protests and protesters themselves instead of debating the underlying ideas. And universities ought to be places where all kinds of ideas abound, including some you like and some you don’t. That’s how we find out how we’re alike and how we’re different, where we come to understand that some of the best ideas come from the outcasts and nonconformists who don’t think the way we do, to learn about the ideas we’ll hold dear and those we’ll reject. Education isn’t supposed to make people comfortable. It’s supposed to make them smarter — capable, perhaps, of grabbing a can of beer or a glass of wine and listening to a homemade mix of Lee Greenwood and the Dixie Chicks. Our short fuses enlarge protests, which depend on our attention for their success. An unnoticed tantrum is just a fit. It’s not an exhibition unless it draws an audience. The subject is more important than the spectacle. The writer David French makes two great points in National Review: That the First Amendment is supposed to protect us from government officials trying to tell us how to act when we see something we don’t like — i.e., President Donald Trump’s broadsides against sports figures taking a knee during the national anthem — and that Americans are supposed to be about ensuring for others the rights they demand for themselves. How did that get so complicated? We’ve had several days now of pronouncements from office-holding pinheads saying they won’t watch the NFL until the kneeling stops. First, who cares? Second, and this is just a pet theory: They either peeked at the Cowboys’ score Monday night or they weren’t really football fans in the first place. Instead, political people are outraged — half of the time. Attorney General Jeff Sessions wants to defend college students who think their speech rights were violated but is also standing with the president against professional athletes taking a knee. He makes a distinction, saying the athletes are “denigrating the symbols of our nation.” He’s fighting political correctness in one venue, defending it in another. The attorney general isn’t alone in that. Lots of us are riled about what other folks are saying. It’s become the national sport — taking offense at protests and protesters themselves instead of debating the underlying ideas. We already had the fight over free speech. The free speech advocates won. The fight over protesters — in colleges, on the sidelines — are distractions from the difficult, interesting and important subjects they’re protesting. Enough of this trivial stuff: Think of the great arguments we should be having instead.